I’m proud to be American. Land of the free and the brave, and of free-thinking people. United we stand, divided we fall. I’m glad it’s November 9th because I’ve missed the camaraderie of some very good friends from the other side of the aisle during this contentious election. Now we can have coffee and talk about the lighter side again. Here are three things to remember – and practice – as we all seek to heal, beginning today. Nobody likes a gloater. Humility is a trait modeled by our Creator. Today is a great day to reach out in love and friendship. I’ve missed a few people that I can’t wait to reconnect with – gently, lovingly, with humility. I’m going to let them know I’ve missed them in my life and can’t wait to reconnect. And I’m not going to talk about politics. Don’t gloat, don’t rant and rave and continue to argue your point of view. Your candidate won or your candidate lost. All of us as Americans now have a new president elect for all of us. Let’s work to support each other, and leave the position arguments behind for today. 3. Focus on common ground. Regardless of our political affiliations, we have a lot of things in common. We just need to look to the outpouring of pro-American sentiment within our nation post 9-11-2001 to recognize that when the chips are down, we come together. If you must talk about politics, focus on the things we all can agree on. That’s the only way we move this nation forward in any scenario. If someone approaches you and wants to “fight” about the election outcome, see if you can come to an agreement on things that our nation needs to focus on that aren’t partisan, like feeding the hungry, creating more jobs, and the safety of our nation. I’m proud to be an American, and proud to call any president who is elected by the people of the United States, my president. 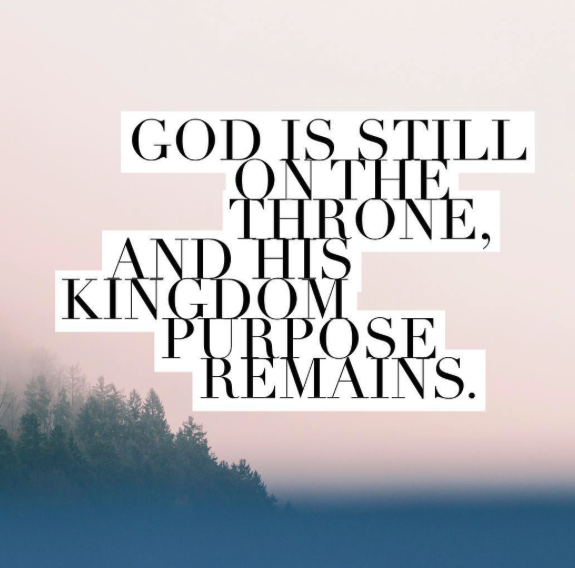 God is still on the throne, and His kingdom purpose still remains. And that purpose is greater than any election outcome. I look forward to seeing you on the high ground!